For a start, I was trying to work out if I could black mark engrave on the back of an iPad. A useful thing to know, obviously, as it means I know what is possible when a customer whats an iPad engraved. The marker spray works well on steel I know (you spray it, let it dry, and laser it, and it makes a very strong permanent black mark). It is meant to work on aluminium too. First problem is spray and laser does not work well as the aluminium is anodised. The black mark is left on the anodising which comes off where lasered. You get a mucky brown effect or at best a sort of grey. Oh, and trying to laser on the curved edge does not work well either due to focus issues. 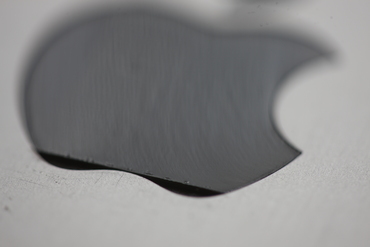 OK, so try a small mark (little apple logo), laser cut the anodising first, spray, and re-laser. Well, sort of works. The iPad slipped and I have two small apple logos overlapping, partly a grey colour, partly a reasonably good but not perfect black and partly just whitish where anodising is removed. Grrr. I suspect with practice I could get it to work, but tricky. When making the artwork I position an apple logo on the blank sheet the size of the iPad so as to get the rest of the artwork right. One then removes the logo and sends to print (laser). Except I forgot to remove the apple logo. This is where the real problems start, watching the machine I realise it is cutting the logo out too. This is not good. So I pause the job, and have to cover the logo. Sending the job and starting again would create alignment issues. I have some engravable plastic, so stick that over the logo to protect it and continue. I could not find any silver foil (which works well for this). So I use a sharp knife to try and peel it off. Reasonably successfully but in the process slice my finger. What else can go wrong I wonder... Well, off to the beer restival at Earl's Court... We'll see.